Modern Law customization goes beyond typical customization abilities. Players are also given the opportunity to customize their vehicles to suit their individual taste, selecting from a range of vehicles and vehicle components through the Vehicle Manager of Modern Law. Today, we will explain the Vehicle Manager feature of Modern Law and why Modern Law players will love it. The Vehicle Manager will allow players to customize their patrol vehicles to their unique preferences while inside the police station garage. The Vehicle Manager feature will be a menu that opens up at a checkpoint in the garage, where the patrol vehicles will be able to be customized or changed out for new models. It adds more of a embodied feeling to the police RPG experience that players of Modern Law will love as they carry out the duties of an officer in Dallas, Texas. The Vehicle Manager feature will allow changing of vehicle models, vehicle components, vehicle colors, default lighting patterns, default sirens, and even more! 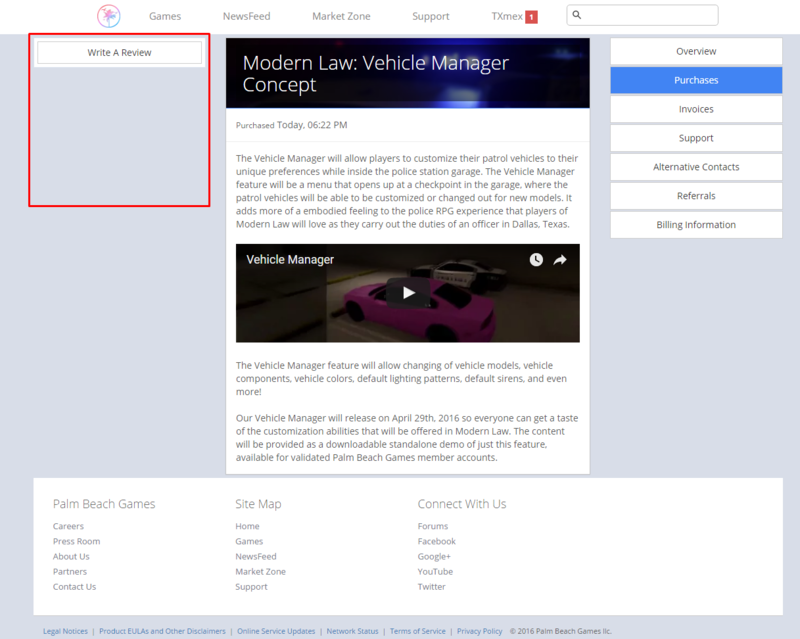 Our Vehicle Manager will release on April 29th, 2016 so everyone can get a taste of the customization abilities that will be offered in Modern Law. The content will be provided as a downloadable standalone demo of just this feature, available for validated Palm Beach Games member accounts. Update: The Vehicle Manager Demo is available for download! Proceed to our MarketZone area, and "purchase" the free content "Vehicle Manager: Vehicle Manager Concept". Once complete, you should be directed to the content's purchased page, in which you'll see a downloadable file on the left side. Thank you for your comment! We are exited for Friday too! Once that demo gets released, how do I download it? Proceed to our MarketZone area and "purchase" the free content "Vehicle Manager: Vehicle Manager Concept". Once complete, you should be directed to the content's purchased page, in which you'll see a downloadable file on the left side. I've taken a screen shot - and where I've highlighted red at, is where you'll see the button. We've uploaded a new build in which you can download now in the same location where you downloaded the previous one. The issue we were experiencing is the previous build was locking everyone who wasn't staff members out. Just a small set back! There are no security codes, we temporarily disabled the PBG Network for Modern Law until we resolved the issue where staff only had access. You should be able to customize your car without any problems from here on. The game is very cool. But on my pc it work very bad and i can't go to settings, idk why. We are very glad that you are interested in Modern Law! Sadly Modern Law is a game designed for computers with good graphics. As of now there is no way to edit the graphic settings in the demo. Don't worry though as you will be able to edit the settings later down the road. Hey guys, i really dont know anything about this thing your talking about. i came here after seeing your sapdfr online post in the MTA forums. is this a server in MTA. if so can i play on it? This is not MTA, and Palm Beach Games no longer offers any support for MTA. This is actually a demo of one of the features on our upcoming standalone game- Modern Law. Modern Law is being developed entirely by Palm Beach Games, designed as an open-world police RPG.